Want to learn more about our wonderful state and have fun doing it? Look no further than these amazing North Carolina museums. Since we’ve visited more than a few, it’s time that we shared some of our favorites from the mountains to the sea. All of these places not just appeal to our little one, but also to us, since we’re curious about the place we call home. These North Carolina museums are great throughout the year, but we also highlighted them in our Winter Things to Do in North Carolina! Got Any Museums in North Carolina to Add? We spend a lot of time exploring the mountains but have also noticed some of the most fun North Carolina museums reside here. At the Asheville Pinball Museum, there’s no need for a pocket full of quarters. Why? Because admission grants you unlimited access to over 80 classic games! With a limited number of occupancy, plan your visit accordingly and understand that there might be a wait, especially on rainy days in Asheville. Biltmore Estate was built by George Vanderbilt’s family and things haven’t really changed since its completion. The house is still family-owned, as Vanderbilt descendants remain involved in the day-to-day operations. Be sure to tour the house, gardens, and also stop off at the winery! 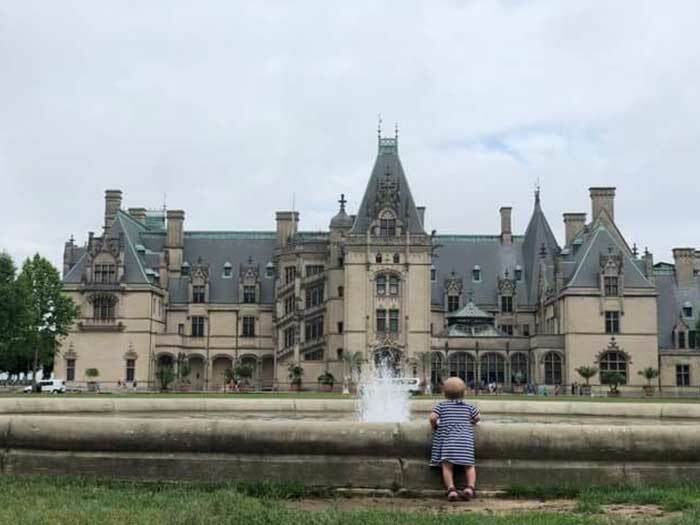 We loved our time at Biltmore Estate in at least a dozen ways, which you can read about here. Inside Asheville’s River Arts District, the NC Glass Center allows visitors to see artists in action, with educational opportunities offered throughout most of the week. Demos and classes are available every day except for Tuesdays and kids aged seven and up can participate in NC Glass Center workshops. While you wait to ride the Great Smoky Mountains Railroad from Bryson City, check out the Smoky Mountains Train Museum. Admission is free with a train ticket and you’ll have access to a collection of 7,000 Lionel engines, a children’s activity center, and more. Walk through the shoes of one of America’s most famous poets at the Carl Sandburg Home in Flat Rock. Sandburg spent the last two decades of his life at Connemara and you can learn about it, the historic goats, and take in the beautiful surroundings. Franklin’s Scottish Tartan Museum and Heritage Center has served as a public information source about Scottish Highland Dress traditions. The museum also has exhibits that cover Scottish immigration to the region and visitors can learn even more with a volunteer-led guided tour. While enjoying Grandfather Mountain’s paths and Mile-high Swinging Bridge, take a moment and check out the Nature Museum inside the park. You’ll find exhibits dedicated to the natural history of the mountain and its surroundings. There are also wildlife habitats nearby with black bears, bald eagles, and more wonderful animals. We encourage a visit to Grandfather Mountain while spending a weekend in Blowing Rock. With the state’s largest cities and some cool small towns, too, the Piedmont has some of the best museums in North Carolina and here are our favorites. 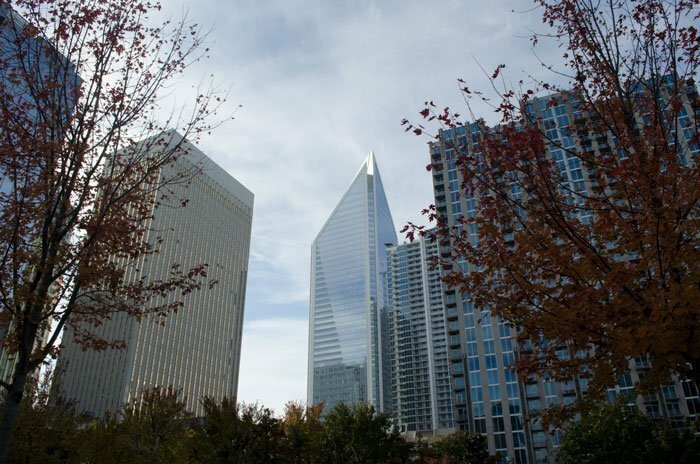 Love that Charlotte skyline but also love the Queen City’s museums! Bechtler Museum of Modern Art was only the second in the country designed by Swiss architect Mario Botta. This Charlotte museum includes works by some of the most important artists of the mid 20th century, including Giacometti, Picasso, Warhol, Hepworth and more. From the four story glass atrium to the bold and dramatic fourth floor gallery, the exterior of this art gallery is just as impressive as the works inside of it. At Discovery Place Science, you can tinker, manipulate, observe, and participate. This is THE place for the next generation of scientists and creatives that are going to mold and change our world. Get creepy crawly in the Bug Lab, hop into a jungle rainforest in World Alive, or get your hands dirty in one of the Explore More labs. If you’ve ever driven through North Carolina, you’ll think it’s only fitting that we also house the NASCAR Hall of Fame! Just 25 minutes away from Charlotte Motor Speedway, The Hall of Fame pays respect to former drivers, crew chiefs, and major contributors to NASCAR. There’s even a 33-degree banked ramp like Talladega Superspeedway, which is filled with 18 different cars, several rotating exhibits, the Hall of Honor, and simulators. We mentioned these fun North Carolina museums in our guide to a weekend in Charlotte, too! Many folks might not know that Bennett Place in Durham is where Joseph E. Johnston met with William T. Sherman as part of the largest surrender of the American Civil War. That’s what prompted Robert E. Lee’s surrender in Appomattox just 17 days later, ending the Civil War. Learn about this moment in history at the visitor center or attend one of the living history programs. You can even read more about the event with this book about Sherman and Johnston at Bennett Place. Have you ever seen baby red wolves or built a tornado with your hands? Durham’s Museum of Life and Science (MLS) is an interactive science museum that’s great for all ages. 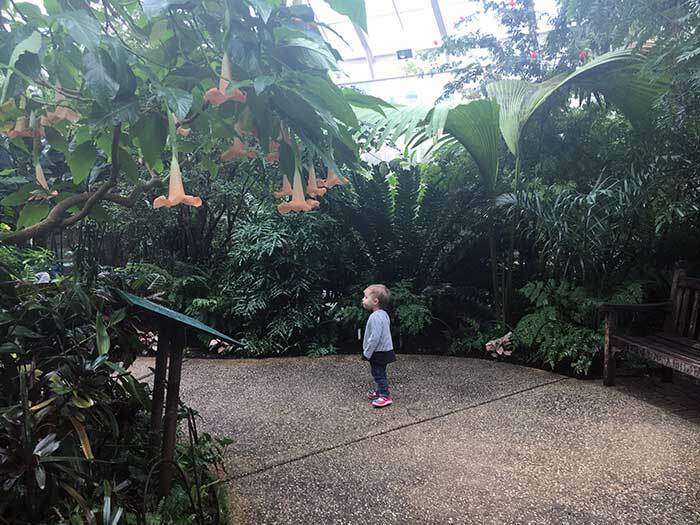 Their huge outdoor section has treehouses, butterfly garden, lemurs, and a spray ground, which makes it just as impressive as the indoor space. Hanging out at MLS is also one of our favorite weekend things to do in Bull City! 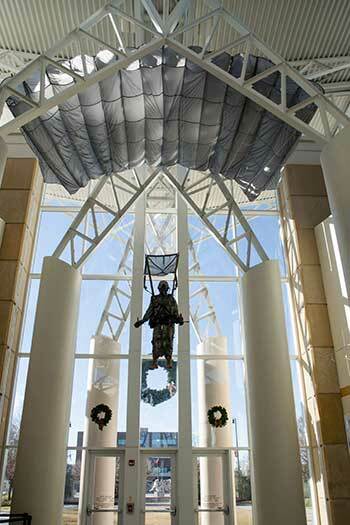 Spend an entire morning strolling Fayetteville’s US Army Airborne & Special Operations Museum. With plenty to do inside and out, the main exhibit starts with the history of airborne and special operations from the 1940s to current units. 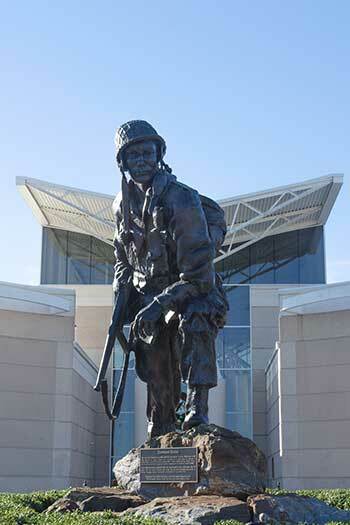 Spend a moment at Iron Mike, the 3,235-pound statue dedicated to all past, present, and future paratroopers or pause at Constant Vigilance, the first memorial for K9 soldiers killed in action. We included this museum among our favorite winter things to do in Fayetteville. If you’ve got little ones, you’ve got to visit the Children’s Museum of Alamance County in Graham. Not only will you find a lot of fun hands-on exhibits for kids, but there’s also something for parents and adults to join the fun, too! Outside at the Greensboro Children’s Museum. With more than 20 permanent hands-on exhibits and an outdoor space, Greensboro Children’s Museum has tons for you and the little ones to explore. 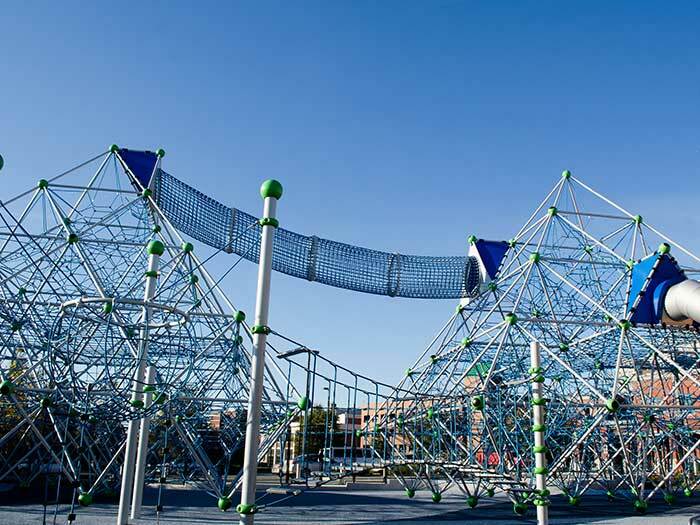 It’s perfect for children of all ages from infant to big kid! The outdoor section has an awesome 30-foot Neptune XXL Climbers for every adventurer. One of our favorite museums in North Carolina is theGreensboro Science Center. It’s hard to top their aquarium, museum, and zoo. And outside, you’ll find SKYWILD, a treetop adventure park where you can zip, slide, climb, and fly through the trees. Greensboro’s International Civil Rights Museum memorializes a courageous moment in our history—the sit-in movement. Today, you can stroll through the museum which remembers the A&T Four and the American Civil Rights Movement through exhibits and videos. We included all three of these museums in our guide to a weekend in Greensboro! 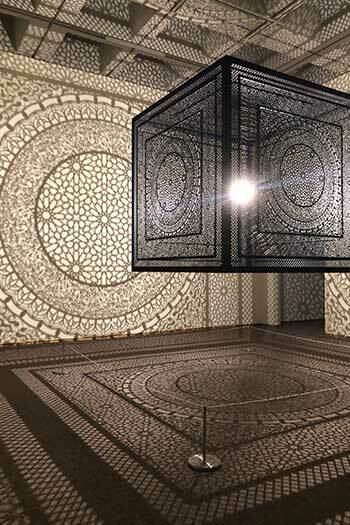 Inside NC Museum of Art during their special “You Are Here” exhibit. Outside the NC Museum of Natural Sciences. The Contemporary Art Museum of Raleigh (CAM) lives up to its name, thanks to a constantly rotating exhibit lineup. We’ve enjoyed walking around during our weekend visits to Oak City, but they’re also open on Thursdays and Fridays, and Tuesdays and Wednesday by appointment. Right in the middle of Downtown Raleigh, Marbles Kids Museum is filled with huge play spaces, an IMAX Theater, cafe, and more. They also have a pretty busy events calendar and offer camps and classes throughout the year. The perfect place for a day date, the NCMA has a free permanent collection as well as impressive past exhibitions like Ansel Adams, Georgia O’Keeffe, and You Are Here. Wear some comfortable walking shoes and visit The Ann and Jim Goodnight Museum Park trails, which connects to the Reedy Creek Greenway. Free and open every day, North Carolina Museum of History has exhibits on the tar heel state, NC Sports Hall of Fame, North Carolina & World War I, as well as a replica of Raleigh’s 1920s J.C. Brantley Drugstore. 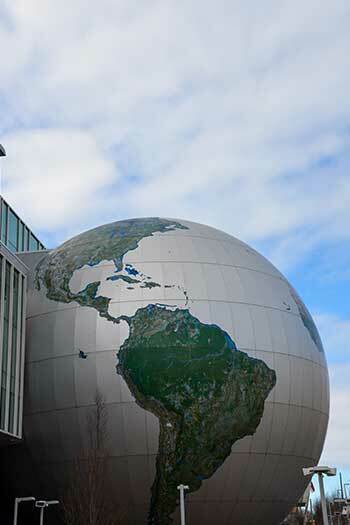 North Carolina Museum of Natural Sciences is easy to recognize by the giant metal globe exterior. On the inside, it is filled with beautifully curated exhibits and houses creatures that live in North Carolina. And the best part? It’s free! We included these museums when talking winter things to do in Raleigh and also day date ideas in Oak City! The Earl Scruggs Center honors the Cleveland County native and the cultural and historic traditions of the Shelby area. Permanent exhibits mix with rotating ones to explore Scruggs’s life, career, and more topics that will keep you coming back for more. Smithfield’s Ava Gardner Museum recognizes one of Hollywood’s most famous actress/singers who just so happens to be a Johnston County native. Visitors can check out Gardner’s costumes, awards, rare movie posters, and much more. 60 acres of trains, automobiles, tractors, and fun await you at the NC Transportation Museum! Located in Spencer, this place commemorates Spencer Shops, once the Southern Railroad’s large steam locomotive repair facility on the east coast. There, you can go on a train ride or attend the Fire Truck Festival, Days out with Thomas, or The Polar Express Train ride! 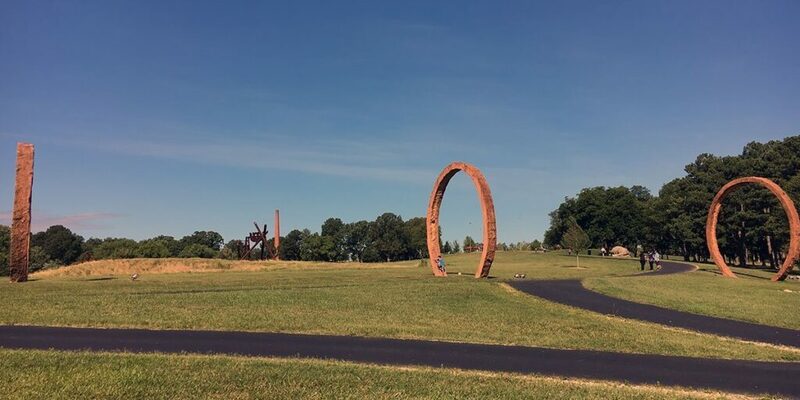 Head to Star in Montgomery County and you’ll find one of the state’s most interesting artist-led business communities, known as STARWorks. You can get your hands dirty by partaking in classes and workshops dedicated to ceramics, glass, and clay. 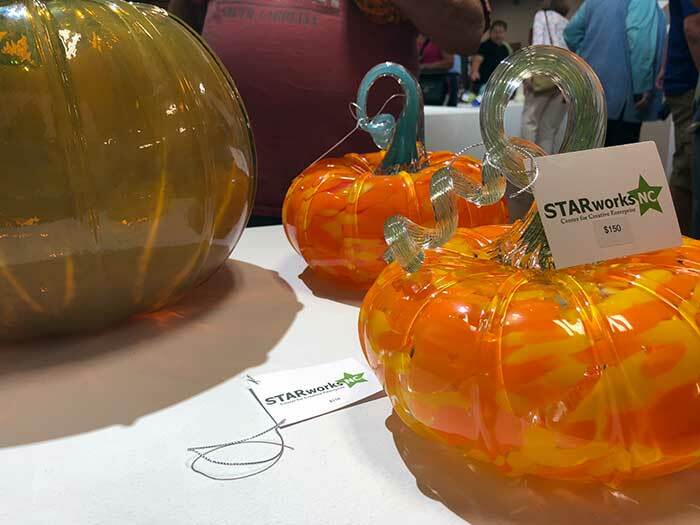 One of our favorite events is the STARWorks-hosted Annual Glass Pumpkin Patch in the fall. Inside one of the Moravian shops that make up Old Salem. Kaleideum in Winston-Salem is actually two museums (North & Downtown), which were formerly the Children’s Museum of Winston-Salem and SciWorks, respectively. Both feature interactive exhibits and Downtown has a very fun recreation of Krispy Kreme that our daughter just didn’t want to leave. Kaleideum North has a planetarium, nature trails, live animals, and more. Fun Tidbit: If you purchase a ticket at one Kaleideum location, you get in FREE to the other if you visit on the same day! Old Salem is a popular historic district in Winston-Salem. It also serves as an educational tool and showcase the North Carolina’s Moravians in the late 18th century. One can easily spend a day or more visiting the various shops, historic buildings, gardens, and everything else that makes up the place. 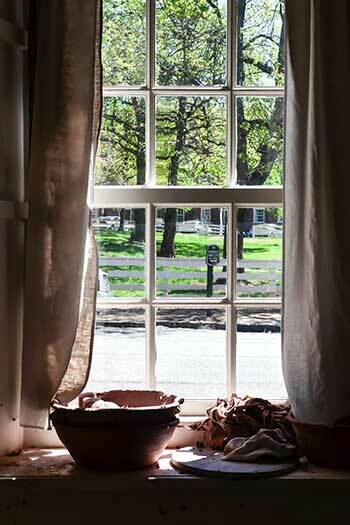 We really enjoyed our time at Old Salem and shared eight ways you can explore it here. Reynolda House is an American Art Museum and exhibition house designed and decorated by the Reynolds family in 1917. Complete with a bowling alley, squash court, indoor pool, and luxurious interior design, you can transport yourself back in time. The nearby gardens have some cool designs and are a great spot for throwing down a blanket and relaxing for a while. We included all of these fun museums in our guide to a weekend in Winston-Salem. Most folks head to the Coast to check out the water, but there are also some pretty fun museums found here! Checking out the fishies at NC Aquarium on Roanoke Island. Operating for over 40 years, NC Aquariums offer education, resources for rehabilitation, and research for marine creatures. Locations include Roanoke Island, Pine Knoll Shores, Fort Fisher, and Jennette’s Pier. If you ever wondered why North Carolina license plates read “First in Flight,” the Wright Brothers National Memorial will show you why (Sorry, Ohio!). Here, you’ll learn about the two brothers who changed the way we travel. You can also see all the steps and crashes it took to finally reach the sky in Kitty Hawk. 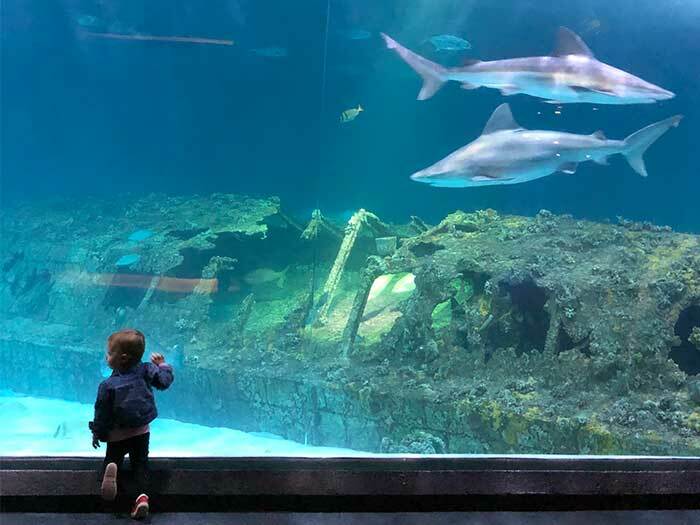 We mentioned a visit to NC Aquariums and the Wright Brothers Memorial in our guides to any weekend and the off season guide to the Outer Banks, too! One might not realize as they walk the scenic trail at Fort Fisher that this site was the Civil War’s largest amphibious battle. The Visitors Center offers education and recreations of the battle as well as artifacts recovered from sunken ships. Parts of the fort remains can be seen along the trail and divers can grab a dive map and explore the wreckage of the blockade runner Condor just 700 yards off the beach. At the bottom of Hatteras Island, you’ll find the Graveyard of the Atlantic Museum. Here, you’ll find a commemoration of the 2,000-plus shipwrecks sunk off The Outer Banks. That’s how the area got the name Graveyard of the Atlantic. There are also exhibits that touch upon maritime culture, history, wars, ghost ships, and more. Graveyard of the Atlantic is housed under the North Carolina Maritime Museums, which you can find in Beaufort and Southport, too! Tryon Palace is an ode to North Carolina’s first permanent capitol, which sat in New Bern until the original building was destroyed by fire in 1798. 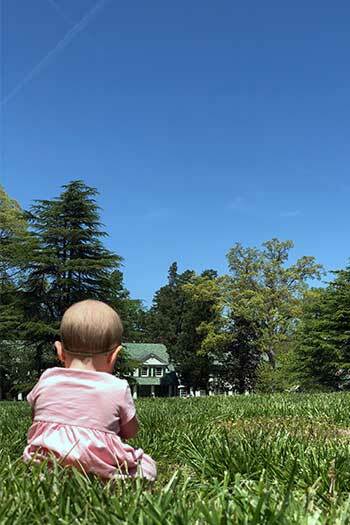 Today, visitors can come and learn about its place in history, as well as tour the gardens and other historic buildings after starting at the North Carolina History Center. 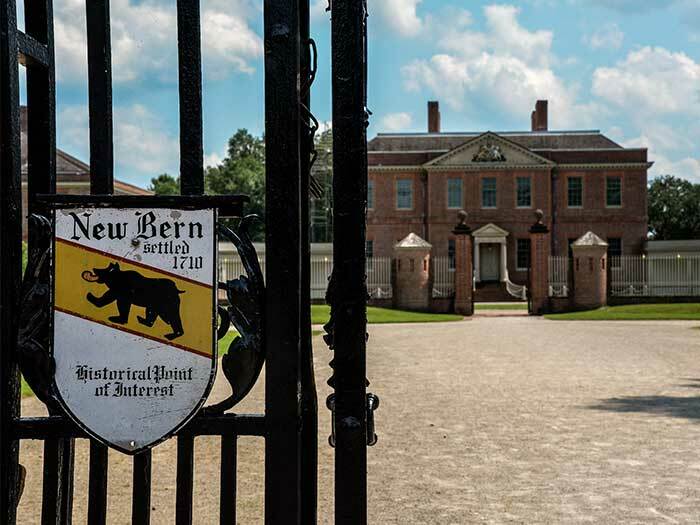 We covered Tryon Palace on Travel Through Life and also included it in our guide to a weekend in New Bern here! A piece of history is docked in the waters in Downtown Wilmington. Walk the deck and learn about what life was like for soldiers on the USS North Carolina in the Pacific during World War II. Since you’ve gone through our top picks, we’d love to know which one you love the most. Also, did we leave out one of your favorite museums in North Carolina? We’d love to know more about it and might even try to visit really soon, since we’re a bit addicted to learning about our state. This entry was posted in Travel and tagged Alamance County, Asheville, Charlotte, Cherokee, Durham, Fayetteville, Graham, Greensboro, Hatteras, Kitty Hawk, Kure Beach, Museums, New Bern, Raleigh, Shelby, Smithfield, Spencer, Star, The Coast, The Mountains, The Outer Banks, The Piedmont, Wilmington, Winston-Salem. Hi Kelly, that sounds like a fun museum! Thanks for sharing and we’ll be on the lookout for it when we’re in Jackson County next. Wow, some awesome suggestions. Really appreciate it, Rich! Thanks for stopping by and commenting. Dales wheels through time museum in Maggie Valley. Nice. That one sounds fun. Thanks, Joe!